The space which the propeller of the air-ship occupies in Keely's laboratory comes within a radius of six feet square. A small space for so powerful a medium - distributing over one thousand horse-power, as tested by experiment. 1. Positive graduating Chladna; guiding by polar action toward the north and reversing by depolar action. 2. Sympathetic polar negative transmitter; for operating and controlling the action of the machinery in producing polar and depolar power: liberating the latent sympathetic power in twenty-seven sensitized discs. 3. Polar and depolar intermittent accumulator, carrying eight focalizing discs for receiving and distributing the sympathetic polar negative flow. This device takes the energy sympathetically from the polar negative stream on the same order that a dynamo registers electricity from the earth to be distributed and redistributed: running the machine sympathetically. 5. Two resonating drums: one positive, one negative, which multiply the intensity of the sympathetic flow. 6. Twenty-seven depolar triple groupings, nine in each grouping, consisting of three vitalized discs with resonators. These reply sympathetically to polar and depolar action. 7. Large polar ring. This ring is associated with the central resonators by nine resonating polar discs placed at equal distances. This is the medium for distributing the polar flow. 8. 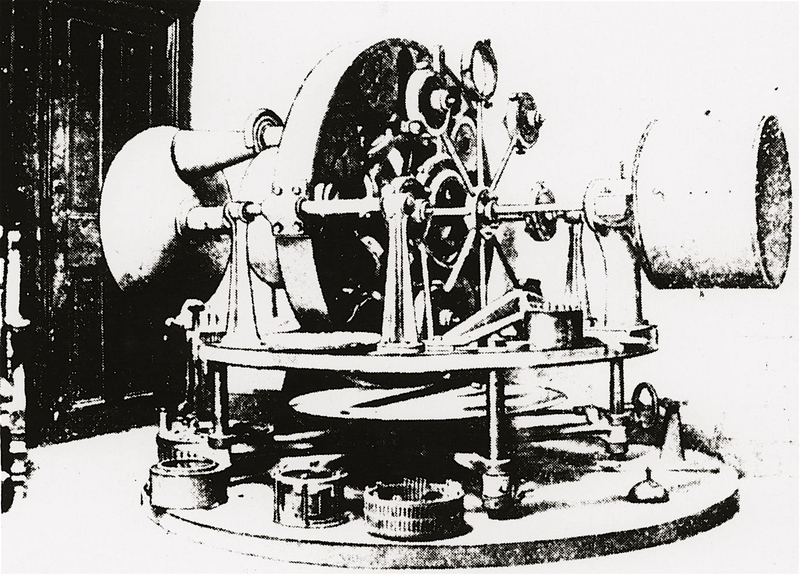 Small negative ring, which is the governor of the propeller, associated with a polar bar that oscillates from the polar field to the depolar field, somewhat on the order of a magnetic needle, governing the action of the machine to any given number of revolutions. The sympathetic rotation that exists in the resonating centre of this ring holds the neutral centre in subservience to celestial radiation, whereby a certain order of sympathetic disturbances gives the sympathetic radiation the requisite power to draw it to itself, accomplishing what is called atmospheric suspension on the same principle as that of sympathetic suspension. The condition of the mechanical requirements necessary to conduct successfully the line of research which Keely has been pursuing will be properly appreciated, now that he is able to demonstrate the simplicity and beauty of his system, under perfect control for commercial use. Modern materialistic science is altogether unprepared for the revelation given in sympathetic vibratory physics; a revelation foreshadowed in this passage from the writings of de Maistre. "Religion and science, in virtue of their natural affinity, will meet in the brain of some one man of genius, and the world will get what it needs and cries for - not a new religion, but the fuller revelation of revelation." Does the following sentence reference an additional air-ship made by Keely and sold to a "California gentleman"? Would this time period (6/7/1885) relate to early sightings of mysterious flying craft in California? John W. Keely, discoverer of Sympathetic Vibratory Physics, found a means of negating the effect of gravity as well as developing a form of propulsion. From 1888 to 1893, Keely worked on developing his system of “Aerial Navigation.” The first successful test was in 1893 which led the way to the construction of an aerial craft. In 1896, Mr. Keely had so perfected his system that he arranged to give a demonstration of the aerial craft to the United States War Department. In attendance at the demonstration were a number of invited members of the press. Descriptions of the craft state that it was a circular platform roughly 6 feet in diameter. On this platform was mounted a small stool set before a keyboard. The keyboard was attached to numerous tuned resonation plates and vibratory mechanisms. The controlling mechanism consisted of a row of 100 vibratory bars representing the enharmonic and diatonic scales. When half of the bars were damped the craft would move at 500 miles per hour. If all the bars were damped, gravity would resume control and the craft would settle to the earth. It was unaffected by weather and could rise above any storm. The instrument for guiding the airship was distinctly different from the propelling feature. By damping out certain specific notes, Keely could cause the airship to accelerate to any desired speed. The experiment was carried out in an open field with observers from the War Department and news media. The ship was said to have accelerated from 0 to 500 miles per hour within a few seconds. Most astounding was the apparent total lack of acceleration effects to Mr. Keely as he sat on the stool before the keyboard, controlling the airship.